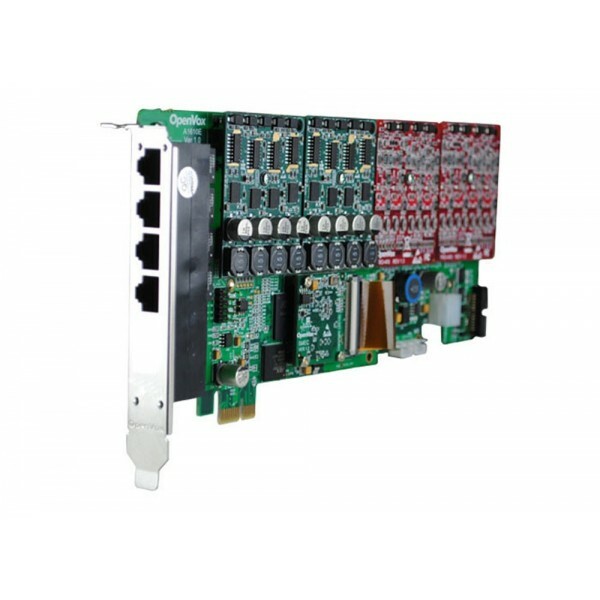 OpenVox AE1610E takes full advantage of Octasic. Hardware Echo Cancellation Module to deliver the superior voice quality on both FXO and FXS interfaces in all 16 ports. Produk ini tidak dijual satuan. Anda harus membeli sedikitnya 10 jumlah untuk produk ini. AE1610E is a new generation analog card with Octasic® Hardware Echo Cancellation Module on board. With the interchangeable quad-FXS and quad-FXO modules, AE1610E can eliminate the requirement for separate channel banks or access gateways. Once the Octasic® DSP module EC2032 is added to the AE1610E, please make sure you are ready to say goodbye to the poor voice quality and echo echo echo in your phone system. No one will even get a chance to hear that any more! The AE1610E with Octasic DSP module will support Telco-grade hardware echo cancellation on all channels, up to the card’s maximum configuration in 16 ports with no additional CPU load. AE1610E works with Asterisk®, Elastix®, FreeSWITCH™, PBX in a Flash, trixbox®, Yate™ and IPPBX/IVR projects as well as other Open Source and proprietary PBX, Switch, IVR, and VoIP gateway applications.